Wouldn't you like to always have the choice of the currency you pay with anywhere in the world? Crypterium is aiming to give you that. And to be a truly global company, we need to constantly keep an eye on cryptocurrency policies in different countries. So let's explore the cryptoworld in our new column: The World CryptoMap. 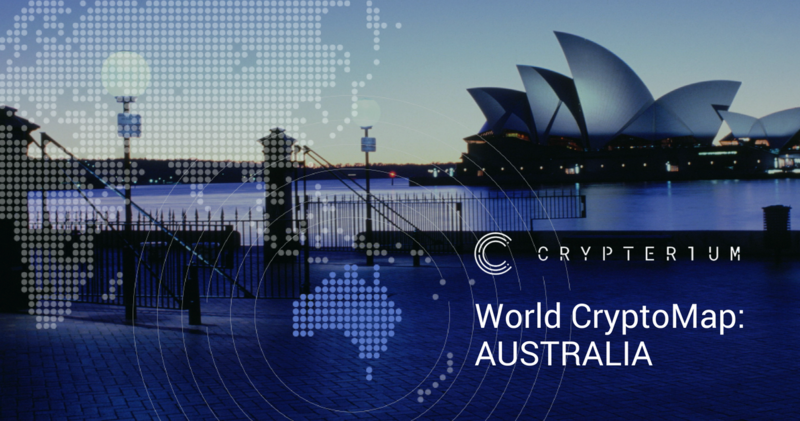 In the first instalment, we're going to take a closer look at Australia and see why it has already earned the nickname of a “crypto continent”. Ranked 13th globally for BTC volume by currency with a volume of AUD $2,956,707.60 or 268.38 BTC over a 24 hour period at the time of writing, Australia is a rapidly growing market for Bitcoin. Moreover, the government sports a remarkably open-minded approach to the legislation of crypto assets. Back in December 2013, then-Governor of the Reserve Bank of Australia Glenn Stevens proclaimed that Australian citizens were free to choose any currency to their liking to pay for goods and services. In 2017, Minister for Justice Michael Keenan stated that Australian laws would be aimed at preventing organized crime and terrorism but at the same time would not hinder the development of any legal financial sectors. Australia has a clear and supportive policy of cryptocurrency regulation with much focus on exchange registration. Last month, the Australian Transaction Reports and Analysis Centre (AUSTRAC) published the latest requirements for cryptocurrency exchange providers. According to the document, cryptocurrency exchanges have to register with AUSTRAC, verify the customers' identities, adopt and maintain an AML/CTF program to identify and mitigate money laundering, and report any suspicious matters (including any transactions involving physical currency of $10,000 or more) to AUSTRAC. Additionally, crypto exchanges have to keep certain records for 7 years. As of now, three crypto exchanges have already been licensed to operate in Australia. The Royal Australian Mint is currently working on the development of its own gold-backed cryptocurrency. The Mint is considering various applications of blockchain technologies; for instance, the blockchain could be used to monitor the logistics. The decision is intended to attract more investments in gold. Yet another great example is the Australian government's recent cryptocurrency taxation announcement. On March 16, instead of simply issuing a notice, they took their time to collect feedback from business owners to find out how the current cryptocurrency taxation laws affected businesses. The feedback was accounted for when making the announcement. The Australian Stock Exchange is determined to act as a trailblazer by being the first large stock exchange to implement a blockchain-based replacement for its post trade settlement system. Power Ledger, a successful Australian startup that raised $34 million during its ICO in October 2017, has been named the global leader in the development of blockchain technologies for the energy sector. Power Ledger offers an energy distribution service that identifies the owner of an energy source and then manages trade agreements among buyers who purchase surplus solar power directly from the prosumer with no extra fees or margin. The blockchain is employed to facilitate these transactions. The technology is currently tested in Australia for residential houses, as well as for wholesale and retail trade. On a somewhat similar note, Australia is going to house a 44.5 acre solar-powered cryptocurrency mining farm, courtesy of Hadouken Pty Ltd. Led by local energy entrepreneur and crypto enthusiast Ben Tan, Hadouken will install the 20-megawatt solar farm for cryptocurrency mining in Collie. Australia has some of the highest energy prices in the world, while environmental costs of cryptocurrency mining are going through the roof worldwide. Thus, crypto mining operators have some really good reasons to employ solar energy. As shown by the recent survey, 63% of Australia's BTC users view cryptocurrencies specifically as means of investment. Heavily male-dominated (86%), Bitcoin user audience in Australia is biased towards ages 34 or younger (59%, with 25% being under the age of 24). The majority of Bitcoin owners also choose to diversify their investments by holding other cryptocurrencies such as Ethereum (17%), Litecoin (9%), Monero (6%) and other alternatives. Australian entrepreneur Craig Wright claims to be the mysterious Satoshi Nakamoto, the founder of Bitcoin. Wright even went as far as posting a blog entry along the lines of “Satoshi is dead. It is just the beginning”, adding detailed instructions on how to verify the authenticity of his claims about having created cryptocurrency. Sure enough, many crypto enthusiasts are sceptical about the matter?—?but what if Wright is right? More and more Bitcoin automated teller machines (ATM) are being installed around Australia. With bank closures being reported around the country, this influx of Bitcoin ATMs may mean a highly promising future for digital currencies in Australia. Citizens of Australia can pay bills using Bitcoin. This is made possible by The Living Room of Satoshi?—?a free online service that allows settling BPAY-enabled bills in cryptocurrency. Among phone bills, school fees, credit cards and taxes, the Living Room of Satoshi reported handling up to $1 million in bill payments on a weekly basis by November 2017. Some Australians, like Melbourne-based IT specialist David Larkin, go as far as paying all their bills using Bitcoin! In April 2018, UNICEF Australia announced it would be offering users a new way of making donations to the charity: by giving up their own computers' processing power to mine cryptocurrencies. As explained by UNICEF Australia's digital brand and content manager Tony Andres Tang, the procedure will be absolutely safe: the charity will be transparent about borrowing the users' machines for mining, and each user will be able to choose the amount of processing power to give up. The Australians' love towards Bitcoin may sometimes manifest in completely unexpected ways. Right now, crypto enthusiasts can buy Bitcoin and Ethereum from 1200 newsagents across Australia! All one needs is an email address, a phone number, a digital wallet and at least 50 AUD (about 40 USD). Australia showcases a relaxed approach towards cryptocurrency regulations. Meanwhile, Bitcoin is commonly used by the citizens in day-to-day transactions. The Australian society's positive attitude and receptiveness towards cryptocurrencies have made companies devise ways to capture this lucrative market. And if push comes to shove, Australia may very well be the first country in the world to vote for Bitcoin to become the world's currency. We know we have a lot of supporters from Australia; we'd love to hear your side of the story in our Telegram channel.